Home / How to Ship Dangerous Goods and Lithium Battery with ELEX WooCommerce DHL Shipping Plugin? DHL helps you to ship dangerous goods and lithium batteries through its API in WooCommerce. Dangerous goods include a few products used in food processing, chemicals, perfumes, electronic equipment are considered to be dangerous. Or if you want to sure if the item you are shipping falls under dangerous goods category, you can always have a look at the Material Safety Data Sheet. Is coherent with 49 Code of Federal Regulations. But, it is the sender who decides and chooses the mode of transport for the dangerous goods he is to ship. As and sender you can choose either of air or road transport to ship dangerous goods with DHL. All of this does do not ensure a successful delivery of the dangerous product you are shipping with DHL. One of the important factors is that these dangerous substances should not contain any prohibited item. The product you wish to ship should not be prohibited from export in the sender country and it should not be prohibited from import in the destination state or country. Any of such product is not excepted to be shipped by DHL, so it’s equally necessary to know if DHL is going to ship it for you or not. Now, once you know that you can ship the product, the next thing you need to do is to obtain a license or approval from the state government. This is because DHL accepts goods only from senders who have the approval of sending the product. This will not be a problem when you ship with DHL as you receive a great amount of support right form starts with DHL. It works with you till you have the approval. Next is the packing of the product. The packing of the product has to be just the way regulations suggest it to be. Before you go for packing, go through regulations from the bodies like IATA and ICAO. So the product should be properly packed. After you finish packing, prepare a list of documents that comply with regulations with the local authorities and DHL. The labels you print should be correctly labeled. It should have a declaration form signed by the sender and need to be with the package while shipping. Finally, as you select any product to be a dangerous product, which you do at the product level, may have a higher shipping charge. So you should not be surprised if you find a higher shipping rate for the same destination on a normal product. It’s a well-known fact that dangerous product poses a threat to life and property. Any unwanted incident may happen if the product is packed and handles properly. If directly calls for a complete disclosure of information about the product on the labels. Make sure you specify all the products you are shipping. Prior to this pack the items correctly so that the safety of others is not compromised. DHL has been used by shippers from all around the world and all types of businesses. To add to the already long list of businesses, DHL started offering logistics solutions to businesses that deal with dangerous but necessary items. It also offers shipping services for shipping or exporting alcoholic products. Since WooCommerce now powers 50% of all e-commerce stores it started offering these services to e-commerce business through its API. ELEX WooCommerce DHL Shipping Plugin is arguably the best when comes to such API of DHL. This premium plugin is a combination of three if major services offered by DHL. To do it go to your WordPress Dashboard> Products> and choose the product. Click on “Shipping” to fill the HS Tariff Number for the product. You can add the country of manufacture if you want it on the commercial invoice. The three important setting follow the country of manufacture. First is the Signature option where you can select if you want an adult signature for during the delivery. Second, you need to select the Special Service, which lists the type of dangerous good it is. Select the most appropriate for the drop-down that appears. The third is the Visual Check of Age, where the receiver needs to show an age proof to receive the shipment. The special services sections have a list of defined dangerous goods by DHL Express. Each one is based on guidelines for the local authorities. You select the most appropriate services for that very product as a pre-drafted description appears on the label that you’ll print in the admin area. As per regulations, the label for dangerous goods should have a product description and few instructions for the person delivering the package and the person who will receive the product. WooCommerce DHL Shipping Plugin takes care of this quite well. The label printed through the plugin contains the necessary description and instructions according to the special service you choose at the product level. You can create a shipment label after you generate packages for the items. Clicking on the ‘Shipment Lable’ will generate the all valid shipment label and you can now paste the label to ship the package. The label generated follows all the requirements and are ready to be attached to the packing. Here is a sample which mentions the content of the package as “Lithium Metal Batteries- Dangerous Goods as per attached DG-CAO”. This changes with each service in the product shipping settings. 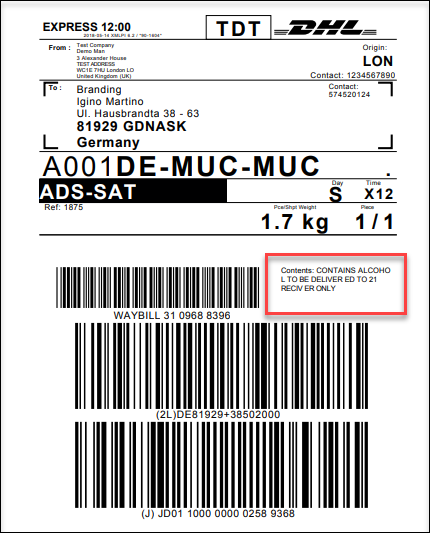 The DHL label generated, contains details which are made necessary by the regulations of the authority bodies. But in case the content of your package is not referred by any of the settings of services, the plugin allows you to customize the ‘Contents’ section. For this, you need to choose None in the Products> Shipping> Special Services. 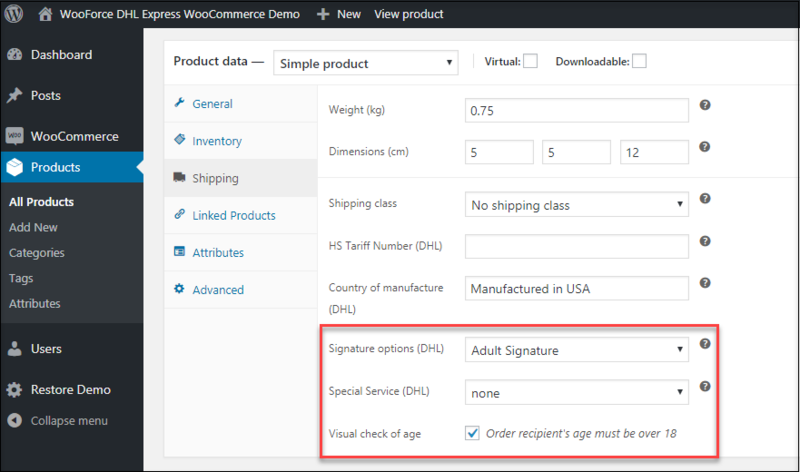 And to add a customized content you need to navigate to WooCommerce> Plugins> Settings> Shipping> DHL Express> Label & Tracking to add text to the box provided. The text entered here appears on the label. 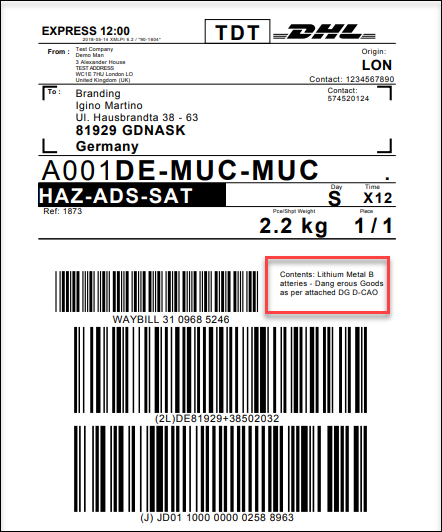 This ensures that you mention every necessary detail to the label you print to ship dangerous goods. And finally, the plugin has an option to print a Commercial Invoice and contains details as required by competent authorities. 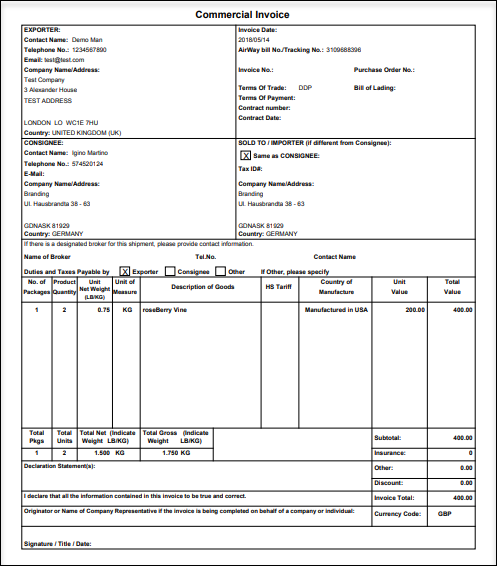 A sample Commercial Invoice is shown below. As per DHL terms and conditions, the person signing this invoice will be responsible for adhering to the specifications and regulations. It will be the signees responsibility to ensure correct documentation and a standard packing of the package. To ship dangerous goods can go either way, you and your business might suffer legal consequences or observe a huge growth in customers and revenue. So it must be your prime concern to comply with the rules and keep in mind the safety of life and property. You must have all permissions in form of documents and have a genuine packing technique for such items. You must also share all necessary details of the content with your shipping partner. DHL Express always has its arm open to help you with documentation and handling and packing of such items. Not to mention, DHL specializes in logistics both domestic and international shipping. And WooCommerce DHL Shipping Plugin brings this expertise to your WooCommerce store. I hope you are ready to ship dangerous goods with ELEX WooCommerce DHL Shipping Plugin and making the most out of your online store. If you want more information on DHL and it’s API you can visit the product page and if you haven’t purchased the plugin yet hit our Online Support with your pre-sales queries.